With coverage of current issues and the latest therapeutic advances,Robinson's Current Therapy in Equine Medicine, Volume 7 provides a concise, all-new reference for the management of equine disorders and conditions. Chapters emphasize the practical aspects of diagnosis and treatment and provide details for therapeutic regimens. This new volume brings you thorough coverage and authoritative advice on selected topics in areas that have seen significant advances in the last five years. Cutting-edge topics include emerging and exotic infectious diseases that may endanger horses in North America; biosecurity strategies; imaging updates; medical genetics; multimodal pain management; and regenerative, geriatric, and oncologic medicine. A logical body-system organization will save you time in finding the information you need. 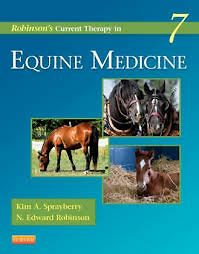 From well-known editors Kim Sprayberry and N. Edward Robinson, with chapters written by nearly 200 equine experts, this invaluable reference provides unparalleled guidance on the latest issues in equine medicine.